The human colony on the planet Agora in the late 22nd century is mired in repression and fear. Every three years, the Cybermen arrive to claim 500 healthy people for conversion. When the Doctor arrives with his new companion Grant, he is swiftly captured and imprisoned by the Overseers who rule in the Cybermen's absence, while Grant soon finds himself involved in the resistance. As the Doctor is interrogated about the whereabouts of his companion, two new time travelers arrive to witness the events of the Cybermen's arrival -- and possibly to even play a part in the history they have traveled into the past to observe. While dozens of the Doctor Who "Missing Adventures" novels were published in the 1990s, surprisingly few of them drew upon the many iconic villains that had been developed over the years in the series' original run. 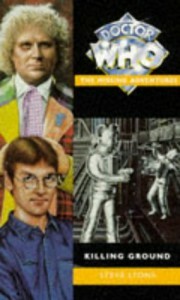 In this respect Steve Lyons's book is an standout in its use of the Cybermen, one of the most famous of the many enemies the Doctor has faced over the decades. Yet Lyons chose specifically to employ the Cybermen faced by the Doctor during his fourth incarnation, one that is widely regarded as possibly their worst depictions ever. Nor is his book helped by his main focus on the Agorans rather than the Doctor or his enemies, leading to long stretches when neither of the central figures in the series appear in the book. Instead the reader is treated to the sort of rebellion-against-tyrant plot that was done a dozen times before throughout the show, only with too many plot conveniences employed to make for a truly engaging tale. The result is a disappointing entry into the series, one that wastes its few enjoyable traits in a mediocre storyline plagued by shallow characterization.